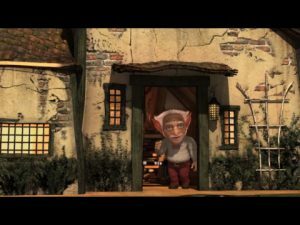 I asked recently to review the iPad version of a couple of the StorySmyth Tales. Having looked at the website, I was intrugied and couldn’t wait to download them from the iTunes store to have a look. I downloaded Scruff Sheep, quick and easy install from iTunes. I got the boys settled down and we sat and watched it together, all cuddled on the couch under a wee blanket. I don’t let the boys play with the iPad at all so they weren’t sure what to expect, however they both play with my iPhone I have to saw I was completely blown away by these. The graphics are astonding, I kid you not, you have to see this to believe it. I shouted my husband over to look at how amazing it was. I did have the HD version which I am sure makes some difference, but if your downloading one and you can get it I’d for the HD version. The opening screen has a wee, cute, old man called StorySmyth. He is so adorable, I could watch him all day. In fact he should have his own app. My boys seem to have associated him with my dad, who passed away 8 years ago, years before they were born. I have no idea why they do this or how they came up with it, but they are calling him Papa Billy. It doesn’t bother me, I think it’s quite sweet. So they think their Grandpa is reading them a story. How sweet. StorySmyth settles down on his big old chair and the story begins. The story itself is in a different format, like you used to get when you watched Jackanory as a child, it switches to the hand drawn story images. Another voice reads the stories and adds in little voices as the characters, its so endering. 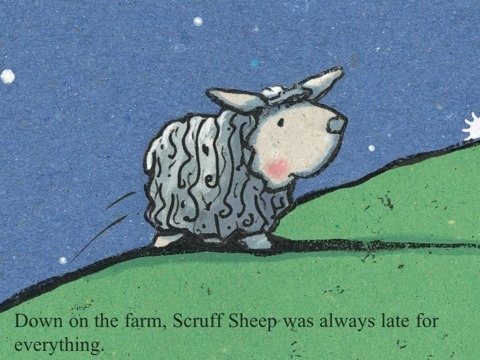 Scruff Sheep by Caroline Jayne Church, is about a sheep called Scruff sheep, who is always late. He is late when the others get their coat sheered and feels so sad. He is taunted and thinks no one likes him. However he saves the day. I also downloaded Hurry Up and Slow Down by Layn Marlow. This is about a hare and a tortise, not the usual one about the race but about two friends, one whom is does everything quickly and one who likes to take their time. Although the are opposite in many ways, the one thing they have in common is their love of a good story. I am not sure which of the two are my favourite, I love both of them and so do my boys. StorySmyth will not replace our bedtime reading, but he does make a nice change and he’s a real treat. My oldest boy is saving up his pennies from his good behaviour chart for another of the stories, that is how much he loves them. I would recommend StorySmyth to everyone, young or old. They have something for everything, fantastic stories, look and sound amazing. What are you waiting for go and download, I can assure you, you won’t be dissapointed. 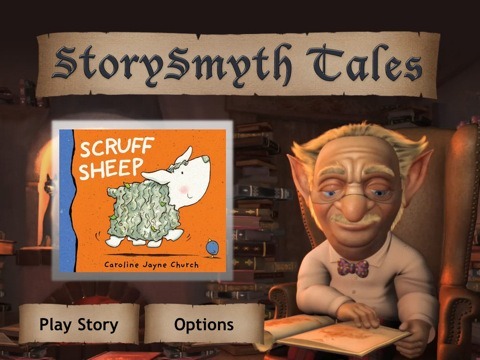 All the StorySmyth titles are available in iPad, iPhone and iPod Touch applications. 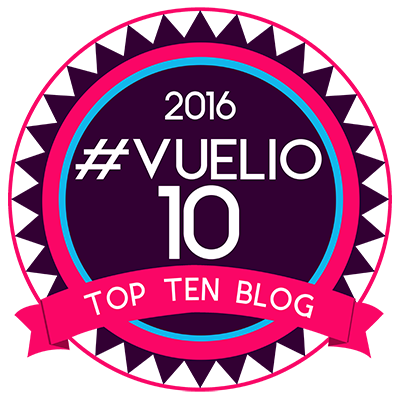 There are six different stories to choose from, you can see them all here. There will be more to follow and hopefully StorySmyth Tales will be available on other devices, such as the DS soon. Have a look at StorySmyth’s Facebook Page for more information and special offers. The website is amazing, I just love StorySmyth himself and could look at him all day. He makes me feel all fuzzy inside. There is even a video you can watch. Check it out here. To purchase any of the stories, they are available download direct from iTunes here. Disclaimer:- I was given a code to download these for free but the review is my honest opinion.